Mona is a Los Angeles-based drummer, singer and performer who believes in making music that unites, elevates and connects. 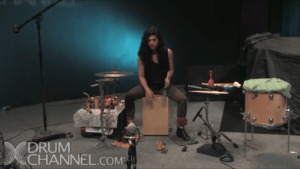 As a solo percussionist, Mona has appeared on A&E’s Private Sessions, where she performed as a trio with Pat Benatar and her husband, Spyder Giraldo. She began her professional musical career in 1999 at UCLA as a founding member of Raining Jane, an all-female rock band. More recently, Raining Jane co-wrote and recorded YES! (Atlantic Records) with Jason Mraz. In support of the album they toured internationally for two years.